Falcon 1 is the first launcher developed entirely under private funding. It was designed and is manufactured by SpaceX. Its purpose is to put payloads of up to 570 kg into low orbit at a very low cost (6.7 million dollars for a launch). 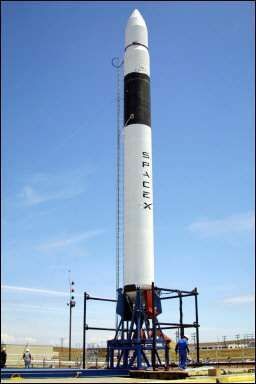 Falcon 1 is a two-stage launcher nearly 21 metres long and 1.7 metres in diameter, weighing 27 tonnes. The inaugural flight of the Falcon 1 rocket was planned for 26 November 2005, but technical problems caused a postponement until 8 February 2006. It finally took place on 24 march, but ended in failure. Following a fuel leak, a fire broke out above the main engine, cutting the supply of helium for the first stage and the rocket exploded less than a minute after takeoff.